I’m having a hard time believing Easter is upon us! I don’t know where the time goes, but I take comfort in knowing I’m not the only one. 🙂 I had a nice productive/super busy Spring Break last week and then traveled to Texas for a memorial service. The bonus, of course, was spending some unexpected time with my parents, siblings, and niece/nephews. But I have to confess I am DRAGGING this week. I happen to have a weekend at home this week and though there’s a few things on the agenda, I plan to sleep in and try to right the ship. READING… I just finished The Swans of Fifth Avenue by Melanie Benjamin. I love books set in NYC, especially early to mid-twentieth century. And I was excited that this particular one brought Babe Paley and Truman Capote to life. But it was much darker than I expected and a little depressing TBH. There’s not a likeable character in the bunch but the story provided an interesting glimpse into NYC society during the ’60s. 2.5 stars from me. I’ve moved on to book number three in the Maisie Dobbs series, hPardonable Lies, by Jacqueline Midspear. Have you read any of these? I love a good mystery and my sister got me started on these. I fully expect to be uplifted by this one! I’ve also been enjoying Maria Shriver’s e-newsletter called The Sunday Paper. It arrives in my inbox on Sunday afternoons and contains a personal message from Maria, a prayer for the week, and a selection of other articles that highlight good news or constructive conversation. It’s such a breath of fresh air and I’ve come to look forward to opening my email on Sunday afternoons for a change. PONDERING… a monthly bucket list. I love a good list, but I’m still thinking through whether this would be a worthwhile pursuit? It would have to be different than just a list of goals for the month (already do that) or “to do’s” (already do that, too). So what would make it different? Level of pleasure or satisfaction achieved by doing what’s listed? Unique nature of what would be on it? What do you think? A friend of mine recently shared that she views list-makers as inefficient people. We had a lively (and funny!) conversation on the topic! I think if all you do is make the lists but they don’t serve any real purpose as far as keeping you on task or moving the needle on your “to do’s”, she could be right. In my case, it helps me remember minor things that might otherwise slip my mind, and gives my days/weeks more focus. How about you? 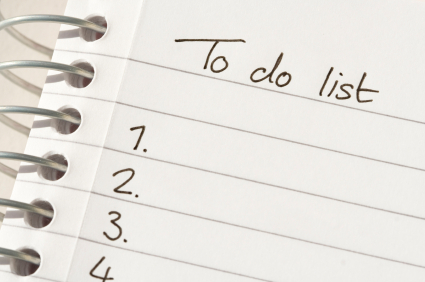 Are you a list-maker and how do your lists serve you? ENJOYING… Trail walks after work. When I realized I wasn’t getting enough fresh air, I decided to hit a trail after work on the days the weather permits. Oh, how I’ve enjoyed it! I can usually log 3 miles or so, but it gives my brain a much-needed chance to breathe. Ok, your turn! What have you been reading, listening to, thinking about or enjoying? Have a great weekend, friends! Disclosure: some of the links in this post are affiliate links and I will make a small commission should you use them to purchase. Thanks for your support!.